“Hitchhiking, for me, is a reminder of the random generosity and kindness that people are capable of.” Photo by Jon Milton. Even atop Tunnel Mountain, the smell of wildfire persisted. Photo by Jon Milton. There we were, standing on the side of the road. It could have been anywhere, really. We were battered by the sun, carrying our backpacks and holding a cardboard sign that read “West.” We were waiting for someone, anyone, to pull over to the side of the road and bring us a bit farther towards the setting sun. Earlier in the summer, Violette and I decided that we would spend a month or two travelling together. I had never been west of southern Ontario, and she hadn’t been out west since having left as a child. We wanted to see the rest of the country, but we didn’t have the budget to travel by bus or by plane. So we figured we would use our thumbs. It seems like a pretty big decision, when you’re making it. I’d hitchhiked before, but always within Quebec, never more than a day or two’s ride. It always surprised me how easy and unintimidating the whole process was; It’s nothing like the horror stories that we’re taught to associate with getting picked up by strangers. Hitching across the country was a whole different ball game though, and I wasn’t sure that I was ready. I packed up my bag in the middle of June. Along with the essentials like a tent and sleeping bag, I tried my best to think of things I might need on the road, and picked them up. I’m now the proud owner of a pocket-sized saw for cutting firewood, as well as an actual hard copy map of Canada. I left Montreal heading east, towards Gaspésie. This first trip was something of a trial run, a test of my luck—and it turns out I was pretty lucky. It’s always smart to get away from major cities when hitchhiking, so we took a bus ride from Longueuil metro to Sorel, about an hour away. Being far enough from the city helped a lot—traffic isn’t wall-to-wall, making it dangerous to stop, and drivers are in less of a rush. Once we were on the side of the road, we did our best to look friendly. We smiled at drivers as they passed, and made eye contact. The fact that we carried big backpacks definitely helped as well—it announced that we were travellers, not bums, as one of our drivers put it. One of the Rockies, from nearby. Photo by Jon Milton. I ended up getting a ride most of the way out with a friendly, conspiracy-theorizing farmer who’d moved out of the city to become self-sufficient. He was still working on it, he said, despite seeing more and more chemtrails in the sky out in the country. I made it to Percé, and jumped in the Atlantic Ocean. It was cold. After coming back to Montreal, Violette and I left westward in the beginning of July, catching an AMT train out to Vaudreuil. We went through a gas station dumpster and got a piece of cardboard, and we made another sign that said “West.” We lost a few of signs over the course of the trip, accidentally leaving it behind or having it ruined by the rain, but cardboard is easy to come by. It started well. Not long after we got off the train, we got a ride directly to Ottawa, our first night’s stop. We had worked out a place to sleep with Couchsurfing, a website that’s basically a free version of AirBnB. We camped in the yard of a tiny house just outside the city, and our host took us on a tour through the marsh nearby. Other nights, we improvised our sleep situation. We’d get dropped off at rest stops right before dark, and head behind the tree line to set up our tents. We always stayed near the highway in these cases, so we could avoid long walks in the morning and situate ourselves by the sound of passing cars. Facebook proved to be a pretty useful tool for finding spaces to crash. After posting on Facebook that we were in whatever city, sometimes it would turn out that we had friends of friends in the city who were willing to put us up for the night, and show us around (shoutout to our gracious host in Winnipeg). 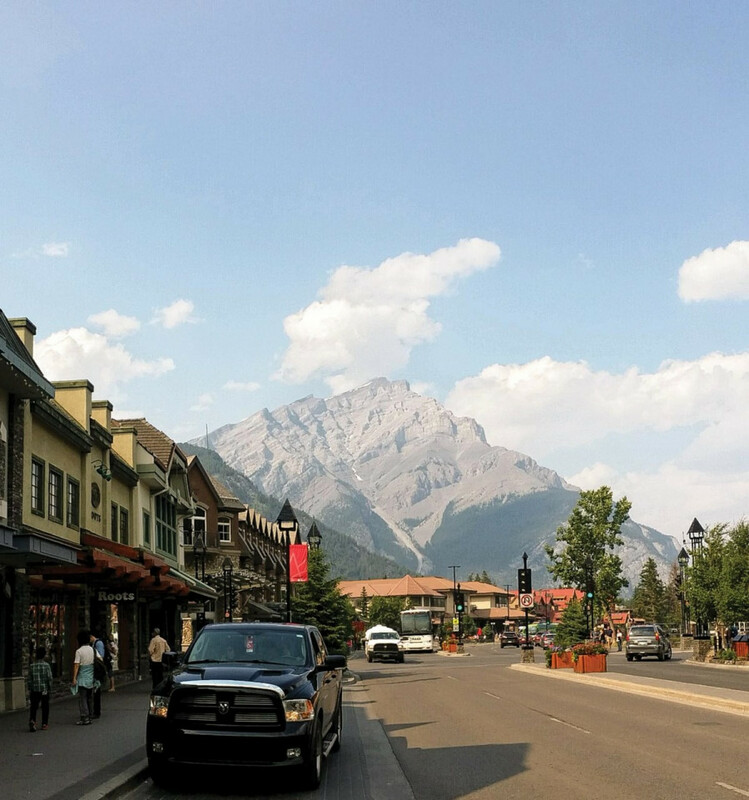 Yes, Banff, AB is spectacular—despite all the tourists. Photo by Jon Milton. We thought about staying in hostels occasionally, but generally avoided it. 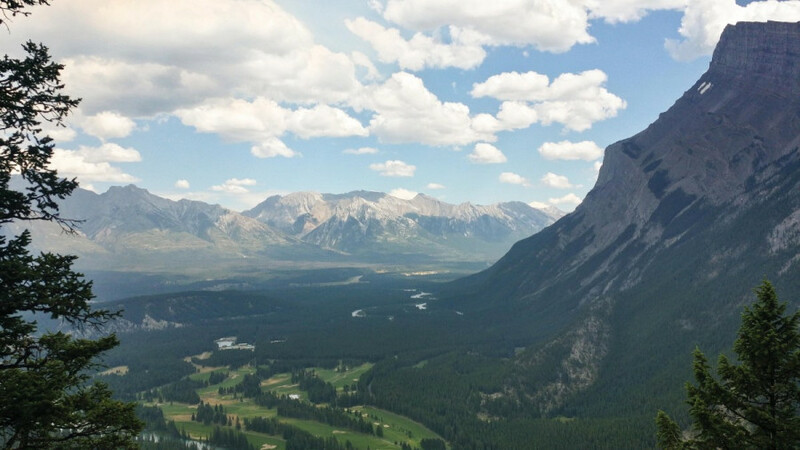 We started looking at them in Banff—where, if you get caught camping illegally, you get a really steep fine—but decided against it because it would cost us $70 each per night. Banff is expensive in general though, so we figured that we could try it somewhere else. We camped in the official campground instead, splitting a single site for $14 each per night. We ended up staying at a hostel in Kelowna when we got stuck in British Columbia. Despite a sign outside advertising beds for $34 a night, it turned out costing $50 each—according to the hostel, prices increased automatically with demand. It definitely wasn’t worth it, and I’d recommend against it if you’re planning a low-budget trip across the country. One thing that’s important to remember when you’re hitchhiking is that you never know who’s going to pick you up. You’ll get rides from someone you’d never meet otherwise—at one point, we got a ride from former NFL player Robert Holmes in rural Saskatchewan. These days, he likes to sit at a gas station in Belle Plaine and watch the cars go by. At a rest stop on Lake Superior, in northern Ontatio. Photo by Jon Milton. For the most part, drivers are really friendly. Hitchhiking, for me, is a reminder of the random generosity and kindness that people are capable of. One former military guy-turned-artist bought Violette and I breakfast and drove hours farther than he planned in order to get us around Lake Superior. A Scottish rafting instructor from B.C. gave us an expensive beer from the local brewery as he dropped us off. A dad from Manitoba bought us ice cream sandwiches and gave us a bunch of food. Drivers regularly went far out of their way to drop us off exactly where we were going, rather than let us walk with our heavy backpacks. Sometimes, rides can be a bit trickier, but we never felt like we were in danger. One driver that picked us up was a dude who, upon hearing that we were university students, launched into a tirade about how leftists were threatening Jordan Peterson’s free speech, or something like that. He was still a pretty alright guy, and could name nearly every single mountain peak in the Rockies—including ones that the “PC police” had changed, like Ha Ling Peak, formerly known as Chinaman’s Peak. We also realized, as the trip went on, just how privileged we are, even as hitchhikers. We’re both white, we were a man and a woman, we’re both young. We got more than one ride from people who had never picked up hitchers before—some of them even described how they see Indigenous people trying to hitchhike regularly, but don’t pick them up because “natives have a bad reputation.” These people weren’t the type to self-identify as racist, but their words were a reminder that the society we live in definitely is. The land we call Canada is vast and beautiful. It’s filled with some pretty decent people, but we’re all shaped by the larger forces that exist around us. From the guy who never sees his family because he works all the time, to the person who believes media hype about imaginary threats to free speech, to the people who don’t pick up hitchhikers of color, the systemic forces around us bleed into our interactions with one another in ways we can’t always perceive. All of that is on full display when you’re hitchhiking. It’s one hell of an adventure, and it’s the cheapest way to travel. I’m sure I’ll be out doing it again next summer.